CHINA LAKE - Call of Duty: Black Ops Guide! It is the last weapon for the Create-A-Class, unlocked at Level 48. The China Lake has a 2 round capacity, and is pump-action. The pumping action is very slow, thus lowering the rate of fire as compared to a pump action shotgun, so most people use switch-out strategies when using this weapon. The China Lake also has very poor mobility, similar to a LMG. 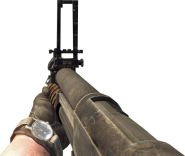 When the player hip-fires it, the sights will be brought up before firing, similar to that of the Thumper in MW2, as well all other launcher-class weapons in Black Ops. Because of these traits, the player has to make sure that the first grenade kills, as otherwise they will have to deal with the long pumping animation while moving too slowly to avoid the enemy. It should also be noted that in multiplayer, the player pumps the launches significantly slower than in singleplayer, probably for balancing issues. Also, the player will have to lead the shot due to the gun's delay between pulling the trigger and it actually firing. A good tactic is to reload immediately after first shot, as it takes less time and can be reload-canceled unlike pump-action. When using Scavenger Pro the player will start with two extra grenades in reserve (note: like all launchers, grenades will not be scavenged when using the regular Scavenger). With this extra ammo, it is important to note that reloading the gun after each shot is actually faster than pumping it (especially when using Sleight of Hand Pro). Using this technique significantly increases the China Lake's rate of fire. The China Lake does 155-25 damage with a 7.5M blast radius. It drops about 17 damage per every meter meaning the lethal blast radius is about 3M. It is rare to find this online due to the very high level the weapon is unlocked at and that the attachment basically does the same thing, yet does not take up the secondary, reloads slightly faster, has easier accessibility, and does not require (technically, players are unable to do this) the user to aim down the sights to use it. Unfortunately, the Grenade Launcher attachment is an underbarrel, so that gives the China Lake a slight advantage over it.